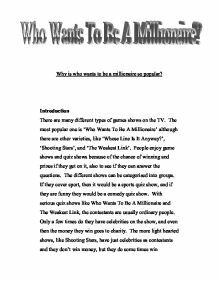 Why is who wants to be a millionaire so popular? Why is who wants to be a millionaire so popular? Introduction There are many different types of games shows on the TV. The most popular one is 'Who Wants To Be A Millionaire' although there are other varieties, like 'Whose Line Is It Anyway? ', 'Shooting Stars', and 'The Weakest Link'. People enjoy game shows and quiz shows because of the chance of winning and prizes if they get on it, also to see if they can answer the questions. The different shows can be categorised into groups. If they cover sport, then it would be a sports quiz show, and if they are funny they would be a comedy quiz show. With serious quiz shows like Who Wants To Be A Millionaire and The Weakest Link, the contestants are usually ordinary people. Only a few times do they have celebrities on the show, and even then the money they win goes to charity. The more light hearted shows, like Shooting Stars, have just celebrities as contestants and they don't win money, but they do some times win miscellaneous items and points. These shows are mainly for entertainment of the viewer rather than that of cash prizes or materialistic value. Who Wants To Be A Millionaire is different from other game shows because the prize money is so great, which adds viewer suspense. By comparison the weakest link, offers up to fifteen thousand pounds prize money, although usually the contestants only win about two and a half thousand pounds. ...read more. As I have shown below. Question 1 - �100 Question 2 - �200 Question 3 - �300 Question 4 - �500 Question 5 - �1,000 Milestone Question Question 6 - �2,000 Question 7 - �4,000 Question 8 - �8,000 Question 9 - �16,000 Question 10 - �32,000 Milestone Question Question 11 - �64,000 Question 12 - �125,000 Question 13 - �250,000 Question 14 - �500,000 Question 15 - �1,000,000 Milestone Question When the contestant reaches a milestone question, that means that they are guaranteed that money when they answer that question. In the first rounds Chris Tarrant is humorous and jokes with the contestant. As the round progresses, he becomes more serious as the contestants are under more pressure and mistakes could be made. There is only one kind of prize, money. In the earlier rounds, before �1,000, there can sometimes be question which is quite difficult, often known as 'the pig'. The contestants have three lifelines, all of which they can use at any time in the game and this is the question most people use their first lifeline on, usually the lifeline they use first is the fifty, fifty lifeline which takes away two incorrect answers. I think they use that one because they ask the audience and phone a friend one's are more useful for harder questions. Contestants The kind of age group in Who Wants To Be A Millionaire is around 25 to 45, the average social class would be middle class people. ...read more. and then to a steady rhythmic beat like a heart beat. That gives a little bit of suspense before Chris Tarrant tells them if they have got it right or not. The camera work in the show, in the beginning before any contestants start, the camera shows you the whole set including the audience, but, when it starts the camera is mostly on the contestants and Chris Tarrant. Occasionally, the camera shows the contestants' partner when the get to a milestone question or when the contestant is not one hundred percent sure of his answer. Who wants to be a millionaire's marketing is on many platforms, TV, radio, games and computer games. There are lots of ways for people to play the games and see if it is the same as on the TV. In conclusion, I think people watch Who Wants To Be A Millionaire because of the different aspects and techniques in the show. The cumulative effect of all the different aspects in the show make it interesting and not like other quiz shows. The audience at home have a chance of appearing on the show and have a chance to win a lot of money. The armchair quiz players have the ability to see how much money they would have won, if they had gone on the show. Who Wants To Be A Millionaire appeals to a wide rage of audience, because almost everyone can answer the questions at the beginning of the show, so the whole family can join in. ...read more. It had no effect on Stuart and he went on to repeat his actions - this time with disastrous consequences. The accident shook Stuart so much, he returned to being very quiet and shy. Up until now, at the counseling session, Stuart has never talked about the accident, apart from in letters to Jenny's parents. They need to be fun but challenging so people also want to play the games, and people want to watch people playing them. The set needs to be quite modern, and the lighting I am going to use is going to be blue and white and will have smoke. The words 'WHO BECAME A GLADIATOR' then appear on screen in the previous format. This informs the audience of the basic plot, by showing what happens next. The gladiator is moving up again, because a gladiator is a little higher than as slave in society. The preliminary round of the show is called 'Fastest Finger First'. This title has been ingeniously used in that the alliteration in the title has been used to emphasise the speed needed in this round, as it is very short, approximately 10 seconds in length. Each time they answer a question, they win more money, and there are certain points at which that amount of money is guaranteed at the end. If they answer any question wrong, they go down to their last 'set' amount of money and the game is over, but they have some things to give them help.